Music is a powerful thing. It can make your happy when you’re sad and arouse memories of particular times, places and moments that you thought you’d forgotten. But, for people living with physical and intellectual disabilities, music can be an even more powerful thing, helping them to respond and engage with activities through music. Music therapists are finding that the sounds and rhythms of music can calm people with a disability, boost their happiness, and even increase their confidence and communication in social situations. 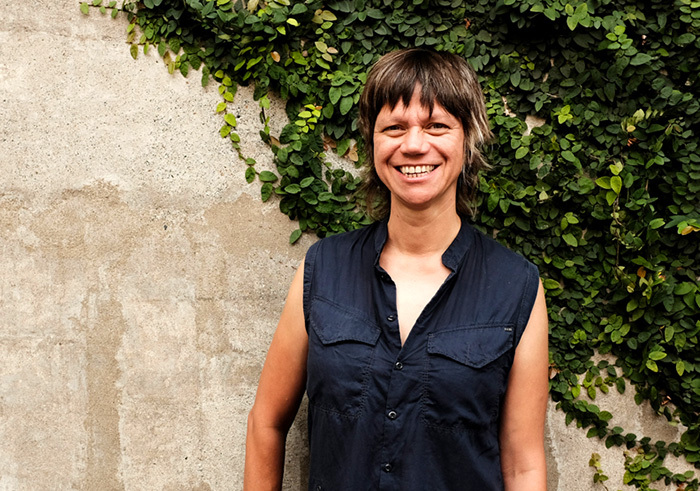 Therapies manager at Music Beat, Kate Fletcher, runs programs for children and adults with disabilities through community organisations and schools. She said music therapy was able to help people of all ages accomplish goals by incorporating music that they reacted to into a session. “We can look at music as its own process and work more on a social and engagement level… and tailor the programs to the individuals in the group,” Ms Fletcher said. Ms Fletcher said Music Beat’s programs assisted speech development, motor skills, communication, social skills and other developmental areas. She said each therapist adapted the program to suit the needs and specific goals of each client, in both group and individual sessions. 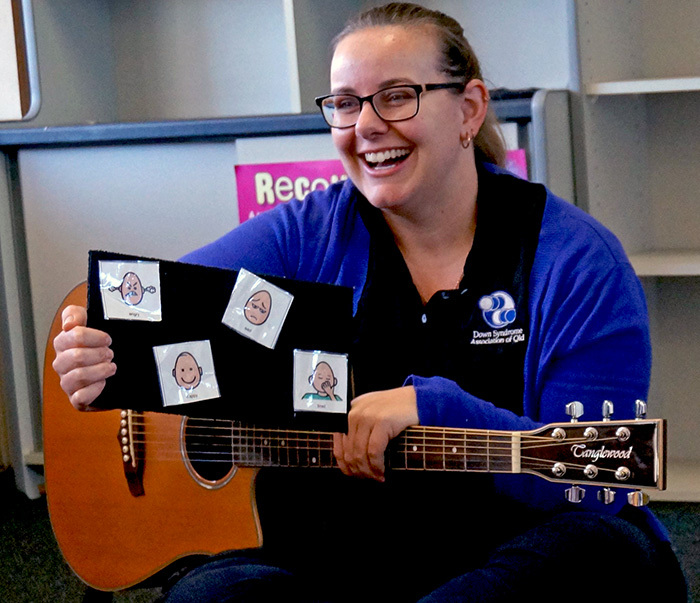 The goals in music therapy are the same as those in speech therapy and occupational therapy, with each of them working to stimulate the brain through speech and rhythm. “Music doesn’t have a specific sense in the brain, it lights up all of the brain,” Ms Fletcher said. “The elements of music help the brain organise the body,” she said. Ms Fletcher said people with a disability were able to help personalise the programs by choosing the music and setting their own goals. “We work with the client’s music preference,” she said. Ms Fletcher said therapists and clients created their own improvised music using instruments such as drums and shakers, as these created easy and repetitive rhythms for people to engage with. “Improvised music can give them more opportunities to initiate a music conversation, in a way that they might not be able to initiate a verbal conversations,” Ms Fletcher said. She said each person responded to music differently, so therapists used different methods depending on the client’s individual needs and responses. Ms Fletcher said the methods used could include singing, using instruments and dance, all of which helped develop cognitive skills and sensory integration. “Music is like another language, but it is a language that can be accessed by all,” Ms Fletcher said. She said the rhythm, lyrics, harmony, melody and beat of music all helped gain the attention of people with disabilities, keeping them engaged. “The biggest element is beat; very steady structured beats will usually be able to help the brain concentrate and focus on other things,” Ms Fletcher said. 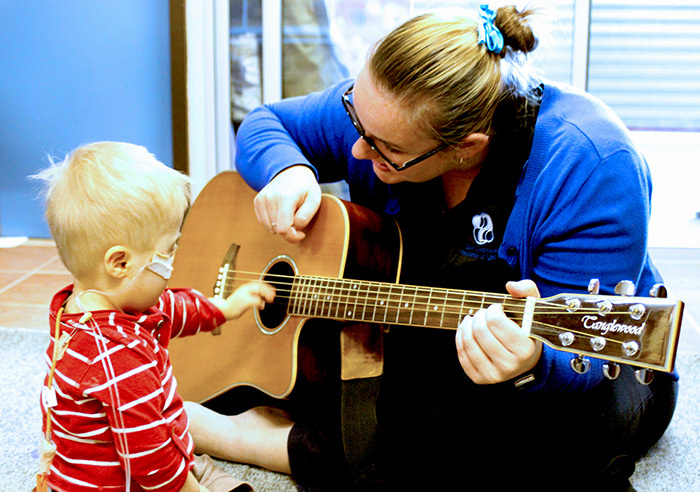 Music Beat runs several programs aimed at helping with attention span, memory and speech. Registered music therapist Tania De Brincat said music therapy was “individually stylised for each person” to achieve their personal goals. Ms De Brincat said she organised activities that could help adults and children in a number of areas, such as their fine motor skills and speech. “[The clients] work on fine motor and gross motor skills by playing instruments and dancing,” Ms De Brincat said. “It activates the brain as music hits a part of the brain that language doesn’t,” she said. Ms De Brincat said music could affect every individual differently. For example, a person with a certain type of disability might be able to communicate using singing while another might communicate using instruments. She said communicating through music gave them the confidence to “use the language they have” to communicate more clearly through speech. “For non-verbal [people] in particular, songs can speak for them,” Ms De Brincat said. Music can also lead to a professional career for people with disabilities. 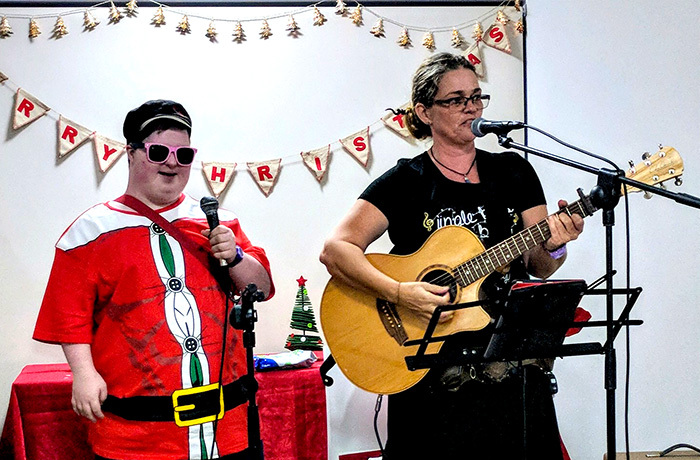 Businesses that are dedicated to music and art create opportunities for people with a disability to achieve their dream careers as singers, instrumentalists, actors or performers. Accessible Arts is an organisation that helps make these dreams come true, by introducing people with a disability to arts and creative industry organisations and help advance their career. Arts development manager at Accessible Arts, Liz Martin, sets up disability awareness training to help organisations understand how they can help people with a disability. “Through doing this [disability awareness training] we increase access and inclusion for people with a disability as audience members, artists and staff within arts organisations,” Ms Martin said. Accessible Arts provide art development and advocacy programs for people with a disability in areas such as skills development, CV writing and grant applications, which help link them to career opportunities within the arts. “[Grants] have enabled artists with a disability to collaborate on new works across all art forms including visuals arts, performing arts and literature,” she said. Organisations within the creative arts industry, such as film makers, contact Accessible Arts to give people with a disability the opportunity to enhance their careers in advertisements and films that require authentic casting. “We talk through potential projects they may have in mind and link them to opportunities as appropriate,” Ms Martin said. For more information about music therapy, visit the Music Beat website. To find out more about Accessible arts, visit their website.